Instructors, click here for details about required IRS W-9 information. Open studio painting with your friends from 10-2 on 'Open Studio' Fridays throughout the year when there is no class scheduled. The cost is $3/day for members and $5/day for non-members to cover building costs. For a class calendar click here or select Calendar from the menu. 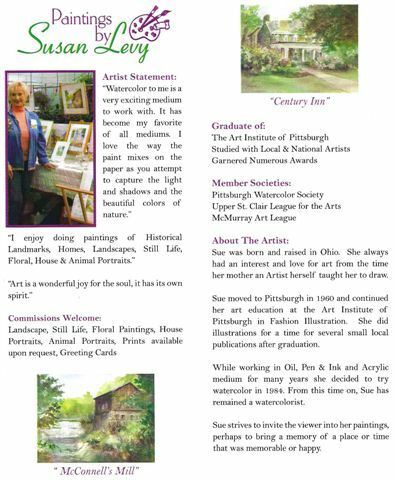 If you have any questions about class content, contact the Class Coordinator, Betty Roseborough, via email at classcoordinator@mcmurrayartleague.com or 412-854-2426.
and ask to be placed on the class list for the classes and dates desired. In the Memo section of the check, note which instructor classes and dates the check covers. You will receive an email confirmation for your registration. There are no refunds or credits given if you cancel fewer than 14 days prior to the day of the class. There will be no last minute cancellations or refunds given once the class is filled and the instructor has been contracted to teach it. We must cover the instructor's fees and our expenses. 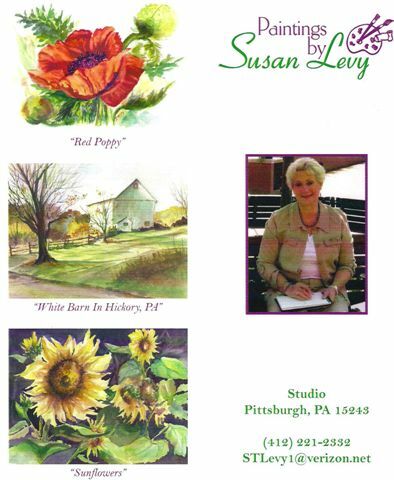 If you need to cancel your class registration, please contact our Class Registrar, Jean Kunz, at classregistrar@mcmurrayartleague.com or 412-831-9992. Consider serving as the Class Monitor for a 25% discount. Duties are listed below and also posted at the Studio. Let the Class Registrar know if you are interested. - Obtain a class roster from the Class Registrar or website and give a copy to the instructor. - Arrive early (check with instructor or Class Coordinator for timing, usually a half hour before class). - Turn on lights and set thermostat. - Arrange tables and do other set-up work as required by class (easels, hairdryers, plastic table covers, etc.). - Start coffee and hot water, set out cups, napkins, etc. - Ensure bathroom is clean and studio is tidy. - Assist instructor and students, as needed. - At end of daily class, ensure bathroom and kitchen area is clean, unplug pots, clean tables, vacuum as needed, put class supplies away as needed, reset thermostat, turn out lights, empty trash and lock the door. - At class completion, send accurate attendance sheet to the Treasurer and Class Registrar so the instructor can be paid.